The founder and owner of JP WinLook is an advanced table tennis player. Our goal is to make table tennis as one of the popular sports in USA. So, we are in business to provide high-quality affordable ping pong paddles, balls, and nets. We are manufacture and also table tennis product end-users, so we know what you care and need as an end-user. Our legs stand in your shoes and socks. We paid outmost diligent attention to details, tested and improved our paddles countless times before we launched this product to the market for you. Once this product hit the market, it soon became very hot by customers' satisfaction with high feedback rating. Your satisfaction is our champion trophy awards. We stand by our reputation of quality and continue to serve our customers year after year. 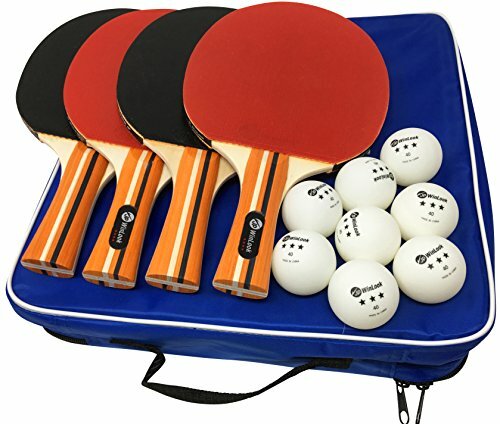 Ping pong supplies are the only a few best fitness items to get Mom, Dad, grandma, grandpa, son, daughter, grandson, granddaughter, ... , all guys involved to play home game hard or easy, inside or outside. Paddles are also the best toy for kids to play on a lightweight mid-size wooden tabletop. With score-board and trainer, small kids are quick learner and can start playing ping pong from three years old (even from toddler age, not a funny joke) on a little light mini short table in their comfort room. To be used for all age (young, old), all gender, and different skill levels, starters, intermediate, to top all-round star master players; offer you the edge when playing loop strokes. Beautiful raquets attract boys and girls, teens and juniors. 60 day manufacturer money back guarantee and 1 year free replacement warranty to let you buy with confidence. Men and women, parents and grandparents, catch this unique sport gear present for your children, grandchildren, friends, ..., for Birthday Party, Thanksgiving, Black Friday, Cyber Monday, Christmas, New Year's Eve, Fourth of July, any holidays, reunions, housewarming, graduation, ... Make the deal for you! If you have any questions about this product by JP WinLook, contact us by completing and submitting the form below. If you are looking for a specif part number, please include it with your message.